I have been trying to eat more whole grains and lately I have really been enjoying quinoa in particular. One of my favorite ways to enjoy quinoa is as the base for a salad. With summer just around the corner the markets have been full of fresh fruits and vegetables. Recently I have been experimenting with using fruits in my salads and my current favorite, the mango, had to make an appearance in a quinoa salad. I have also been adding beans to my salads lately and I though that if I went with black beans I could start a texmex theme for the salad and continue it by adding some peppers, cumin, lime and cilantro. Quinoa can be cooked in a rice cooker and that makes a quinoa salad as easy as throwing everything together. The mango and black bean quinoa salad worked out well. The sweet and cool mango tempered the heat of the jalapeños and the beans rounded the salad out with a nice creaminess. The quinoa salad was good when it was still warm from cooking the quinoa and the leftovers were good straight out of the fridge. Cook the quinoa as directed on the package. 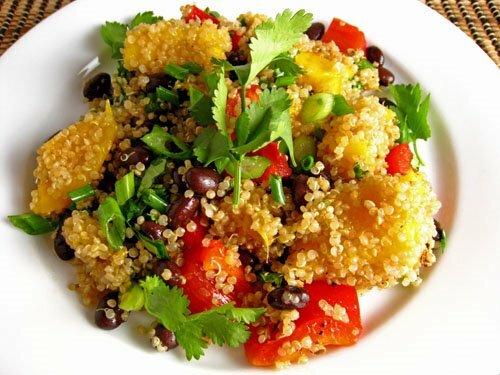 Mix the quinoa, mango, red bell pepper, black beans, jalapeño, green onion, and cilantro in a bowl. Mix the olive oil, lime juice and zest, cumin, salt and pepper in another bowl. Take a look at the No Croutons Require roundup at Lisa’s Kitchen. And thanks for this! Quinoa is probably my favorite grain, and pairing it with black beans, creamy mango and jalapenos is just my sort of thing. Perfect, as always. Perfect way to incorporate more whole grains into one’s diet!! Yum!! Cool and healthy! I would never have thought of adding in beans! It’s such a good idea. Great recipe, sounds healthy. It looks really nice and colorful! Wow, that salad is gorgeous! Looks great with all the different colors! Your salad looks great! Even though I’m not much of a salad person, I’m curious to try quinoa. It does seem to pair well with salad, maybe that will get me eating more fresh vegetables. That’s a mighty colourful plate…and healthy to boot! as always, a great dish! I like mangoes in salad as well. Sometimes I just mix mangoes, fresh lime & cilantro. Let it marinate for an hour and serve it along the meal. Now that is summertime on a plate. Lovely colors and flavors all in one. Yummy! I found your blog via Sidewalk Shoes. Your quinoa salad looks amazing. I’m a big fan of quinoa, and enjoy learning fresh and new approaches on ways to prepare it. Yum! Amazingly beautiful with all those colors! I love it. Mmmm, what a healthy and delicious salad. Looks great Kevin! Looks fantastic Kevin! I have a pack of Quinoa and Black beans too. I will have to make this! I’m pretty new to quinoa and this salad looks so fresh and tasty. Thanks for sharing. This sounds interesting. I’m intrigued by the black beans-mango combo but I trust you: if you say it’s good, then I’m sure it was good indeed. Thanks for this, I too have been eating a lot more whole grains, needed a new one to add to my store cupboard. Very nice combination of ingredients! Using a rice cooker to make quinoa is a really helpful idea. I love the taste of black bean with cumin. this has, like, all my favorite flavors. and is totally quick and doable on those summer days when you don’t really feel like cooking. most excellent. I’ve never thought to make quinoa in the rice cooker. What a great salad! this is absolutely my favorite dish that you’ve ever made. seriously. i like even better than your baklava french toast, which is amazing. this little beauty has all my favorites, and is healthy to boot. kudos to you! So colourful! Quinoa is so delicious and healthy, it looks great on this lovely salad. This looks like a great way to get started using quinoa, which I haven’t tried yet. Kevin, the colours are brilliant! I’m still to try making quinoa myself. I’ve only tried it several times but have loved it each time. That salad looks fab. I have never tried quinoa, maybe now is the time to start. Allright… now I have to try quinoa – you always make it look so tasty. Fantastic! This worked really well with BBQ lamb because the fruitiness really complemented the meat. Many thanks. You’ve been on a mango craze! Mee too, though not shown! Looks so healthy and yummy! I have a packet of Quinoa in my pantry cupboard from a while back and I can make this pretty soon. So healthy and delicious! Light, healthy,great colors,nice salad Kevin! This is lovely!!! What a great salad. I have had a few salds with quinoa – and they were good – or great. This sounds really good – I love the addition of the sweet mango with the beans and the quinoa – sounds like balance with a bit of pizazz! This will definitely be my next try for quinoa! I’m going to try this out as soon as I get some quinoa. Thanks for sharing! Very intriguing salad! Looks delicious. I need to try quinoa in salads more. I wasn’t a big fan of a quinoa salad I made recently, but I think that had more to do with the flavours. Five stars! I love quinoa, having recently discovered it. I also love black beans, mango, and cilantro. All those things together make for a KILLER dish! I made this for dinner tonight, it's superb. Thanks for the recipe! Oh my gosh. Your blog has WAY to much good looking food on it. This looks delish. I LOVE quinoa… discovered it last summer. Hi there! Delicious salad. A coworker of mine made a salad similar to this and wouldn't give me the recipe so I'm glad to have stumbled upon it. I even featured it in an upcoming blog post.